That explanation is misleading. In literary fact, humans’ intense friendship with dogs has a long history. Within circumstances of betrayal in domestic human relations, medieval Latin literature from no later than the year 968 figured a dog as the preferred choice for a man’s friend. Friendship with a dog occurs in medieval Latin literature within a framing narrative of domestic betrayal. In a dog-friend story recorded in Latin in 968, young men plotted to kill their fathers. The young men wanted freedom to pursue their desires without the constraint of their fathers’ views. One of them didn’t kill his father, not because of love, but out of fear. The young man and his wife hid the man’s father in their home. Whenever the king asked for advice, the man consulted his hidden father and got the advice from him. Through the goodness of his father’s advice, the man became an eminent counselor to the king. His friends then began to envy him. They plotted to put him death. Thus sons betrayed fathers, and friends betrayed friends. The donkey in the role of servant suggest the difficulty of finding an obedient human servant. The wife as enemy suggests men’s anguish at perceived betrayal by their wives. The choice of a dog as a friend contrasts with the friends who sought the young man’s life. The dog as man’s best friend is not merely a lap-dog. In this medieval Latin text, the dog is a best friend in a way similar to a man being a best friend to another man. Humans domesticated dogs before they domesticated any other animal or plant. A puppy was found buried in the arms of a human under a home 12,000 years old. Attachment between a human and a dog seems to use the same biological pathways as attachment between humans. A man regarding a dog as his best friend probably occurred long before the earliest text of such a relationship in surviving literature. Domestic relations provide humans with both comfort and anguish. If you seek a servant who will never complain, get a donkey. If you cannot endure any fear that your spouse might betray you, don’t get married. To have a friend who surely will not speak against you, get a dog. The statement “a dog is man’s best friend” is recorded for Frederick, King of Prussia. The claim that “Doug is man’s best friend” is a very recent variant. The ninth-century Latin poem “The Wrangle of the Dwarf and the Hare” recounts a fierce hare overcoming a dwarf and a “timid whelp.” The hare recalls “the injuries done to its people by men and swift dogs.” Trans. Ziolkowski (1993) pp. 303-4. Sedulius Scottus’s mid-ninth-century Latin poem “The Ram” describes dogs viciously attacking a lovable, voluble ram. Trans. id. pp. 262-5. In contrast, Thierry of St. Trond’s twelfth-century Latin poem, “Weep, Dogs” laments the death of Pitulus,a “beloved dog.” Pitulus was a small, weak dog loved for his ability to generate laughter. Trans. id. pp. 272-3. Pitulus is like a lap dog, not like a man’s best friend. Walker-Meikle (2012) provides considerable documentation of dogs as medieval pets. A dog being a man’s best friend is different from a dog being a pet. For example, the Italian poet and orator Andrea Navegero, who lived from 1483 to 1529, eulogized his dog Borgettus as a dog who “loved his master as a two-year-old girl would love her mother.” Id. p. 98. The British Library’s medieval manuscripts blog describes dogs as medieval man’s best friend, but doesn’t provide a specific textual attestation. The story is recorded in a sermon of Ratherius (Rather of Verona), Sermon on the Octave of the Pasch, CC Opera Minora 171-76, from Latin trans. Reid (1991) pp. 510-11. The Latin text is available online in Patrologia Latina, vol. 136 and through the Corpus Corporum website. Rather of Verona experienced throughout his life tense personal relationships and betrayal. Van Renswoude (2010). In ancient Greek myth, Hypsipyle hid her father Thoas while the other Lemnian women killed their husbands and fathers. See, e.g. Pseudo-Apollodorus Bibliotheca 1.9.17. Where can I find a better actor than my little son? Every day he puts on new shows. When he tries to imitate what he sees or hears, he uses comic gestures. He stammers words which he cannot handle properly, and when he cannot say at all what he is thinking, he illustrates it by signs and motions of the body. One moment he is gay, and the next moment he is sad. He cries and laughs, not deliberately as other actors do, but simply as nature and his youth compel. For all this he asks no reward. Trans. Gilliland (1981) p. 53 (senex, the story of the third wise man). The story is set in ancient Rome, and the description of the actor is that of a Roman pantomime. Dolopathos, id. p. 52. In literature arising nearly two millennia earlier, Odysseus and his dog Argos express an affectionate relationship in the context of men betraying Odysseus. See Homer, Odyssey, Book 17, l. 290-327. Grimm (2015), MacLean & Hare (2015). 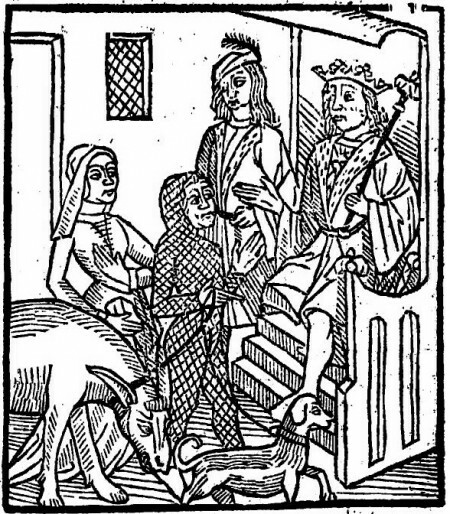 [image] Matheolus with his wife, son, dog, and donkey before King Solomon. Engraving, from image 35 in edition of Jehan le Fèvre, Matheolus qui nous monstre sans varier les biens & aussi les vertus: qui viennent pour soy marier (Lyon: Olivier Arnouillet, 1550), in Bibliothèque municipale de Lyon, Rés. B 487656. Thanks to Gallica. Le Fèvre added to his Latin source that Matheolus should appear before the king neither clothed nor naked. The image shows Matheolus wearing netting. Gilleland, Brady B. 1981. Johannes de Alta Silva. Dolopathos, or, The king and the seven wise men. Binghamton, N.Y.: Center for Medieval & Early Renaissance Studies. Grimm, David. 2015. “Dawn of the dog.” Science. 348 (6232): 274-279. Klein, Thomas, Thomas Rubel, and Alfred Schmitt, eds. 2014. Lamentationes Matheoluli. Stuttgart: Anton Hiersemann. MacLean, Evan L., and Brian Hare. 2015. “Dogs hijack the human bonding pathway.” Science. 348 (6232): 280-281. Reid, Peter L. D. ed. and trans. 1991. The complete works of Rather of Verona. Binghamton, N.Y.: Medieval & Renaissance Texts & Studies. Van Hamel, Anton Gerard, ed. 1892. Mathéolus, Jean Le Fèvre. Les lamentations de Mathéolus et le livre de leesce de Jehan Le Fèvre, de Ressons: poèmes français du XIVe siècle. Paris: Bouillon. Van Renswoude, Irene. 2010. “The Sincerity of Fiction. Rather of Verona and the quest for self-knowledge.”Corradini, Richard, ed. 2010. Ego trouble: authors and their identities in the early Middle Ages. Wien: Verlag der Österreichischen Akademie der Wissenschaften. Walker-Meikle, Kathleen. 2012. Medieval pets. Woodbridge: Boydell Press.